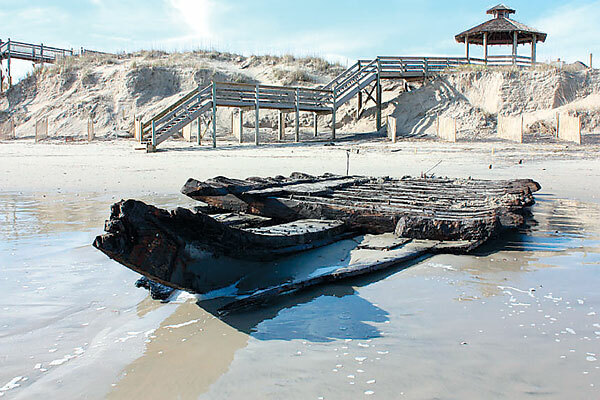 After enduring some 400 years buried beneath the Corolla surf, the oldest shipwreck yet found in North Carolina sits on concrete drying and cracking in the Outer Banks elements. Experts are scrambling to figure out how best to save it: Submerge it in regular baths, soak it for years in a substance also used in antifreeze, coat it in sugar water, saturate it with an expensive silicone oil or freeze-dry it. Or maybe some combination. Advice is coming from several sources, including scientists working on remains of the Queen Anne’s Revenge that Blackbeard commanded and the Civil War-era warship Monitor. Experts at East Carolina University are investigating the wreck in Corolla to determine what ship it was and how best to preserve it. Eric Nordgren, a conservator with the Mariners’ Museum in Newport News, plans to learn more about protecting ancient waterlogged wood while on a trip to England. “It takes a lot of time and resources to preserve a shipwreck,” Nordgren said, adding that funding is limited. It may be that the 12-ton remains of the shipwreck might be better off outside, sitting on a concrete apron just outside the museum’s back door, Schwarzer said. Schwarzer said he is using one short, thick beam to see which is better: indoor or outdoor storage. So far, the beam inside a climate-controlled room also shows signs of deterioration, he said.